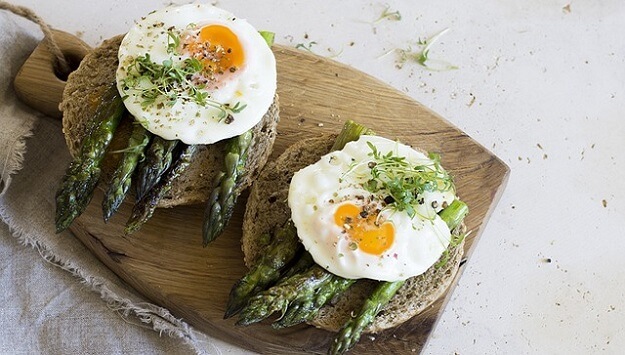 Enjoy the deliciously fresh flavors of spring with this simple breakfast-or-anytime recipe for roasted asparagus with poached eggs & miso butter! Mmmm…Nothing says “spring” to me like the taste of fresh asparagus! In fact, we picked a good-sized bunch from our patch for the first time this year (asparagus takes a few years to really get going before you can harvest much of it). This simple recipe practically screams “spring,” combining fresh asparagus and eggs – always a symbol of springtime! Roasting (or grilling) the asparagus brings out it’s natural sweetness and flavor, while keeping a slight “bite” to the spears, and the creaminess of the eggs provides a great contrast. Use fresh eggs from pastured chickens for maximum nutritional value, and try to get the freshest asparagus you can find. Cook it shortly after picking if you grow your own, or if you are purchasing it from a store, make sure the tips are green and firm – not shriveled – and the cut ends of the stems are not dried out. Coat the asparagus with olive oil, sprinkle with salt, and spread in a single layer on an edged baking sheet. Roast about 10 minutes, until tender. Meanwhile, poach two eggs. Blend the butter, miso paste, and sherry vinegar in a small bowl. From The Fresh Egg Cookbook, adapted from an original recipe by David Chang at LocalHarvest.org.